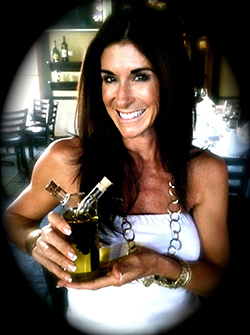 I am always looking for everyday Italian recipes that are healthy and easy to prepare. Apart from all the wonderful breads, pasta and cheeses that are a staple in Italian cuisine, how to make Italian recipes that are healthy is not hard to figure out. This is because of all the other nutrient rich ingredients that are used such as olive oil, tomatoes, and fresh herbs and vegetables. Try these two favorites of mine! Often I will use a rotisserie chicken from Publix or Fresh Market. Debone and set aside. If you prefer to cook yourself, boil and pull apart 2.5 to 3 lbs of chicken and set aside. This is where family preference comes into play. You can add whatever your family enjoys. I add chopped bell peppers, sliced mushrooms and garlic. Heat olive oil in 2-3 qt. on medium. Add paste and garlic plus any other vegetables of choice. Sauté for 4-5 minutes. Add remaining ingredients from #4 and deboned chicken. Lower heat and let simmer for 5 hours. *** This is a great crock pot meal especially with a rotisserie chicken. Lightly sauté tomato paste with garlic and veggies. Add this and all remaining ingredients for sauce to crock pot. Cook on low setting for 5 to six hours. Want to see more Everyday Italian Recipes? 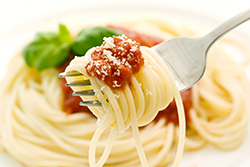 Here is another of my delicious Italian dinner recipes. This recipe is one of the lighter favorites in everyday Italian recipes. Place chicken breasts between 2 sheets of wax paper and pound to desired thinness. Combine whole wheat flour, salt and pepper in dish. In another dish, mix water and egg whites. In last dish, add breadcrumbs. Dredge each breast through flour mixture then egg white mixture and finally dredge through breadcrumb dish. Heat olive oil in skillet and add chicken breasts. Cook 2-3 minutes on each side or until slightly browned. Remove and set aside and keep warm. 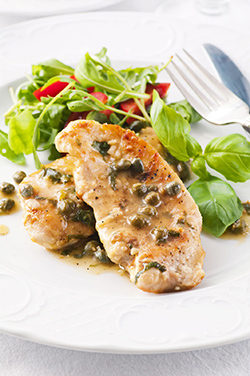 You are almost done with this everyday Italian recipes Chicken Piccata dish! Last step. In same skillet, add final 4 ingredients. Stir and cook for 3 minutes. Pour over warmed chicken. Serve with whole wheat pasta tossed with olive oil and fresh green beans sautéed with garlic and olive oil for a quick side. For a lighter lunch version, serve with side salad. Healthy Italian foods are easy to recreate if you just take the time to learn about healthy fats, better grain choices and which lean protein meats to use as an alternative to fatty sausages and cuts of meat. I would love to hear about your favorite Everyday Italian Recipes. Contact Me and submit your healthy recipe!